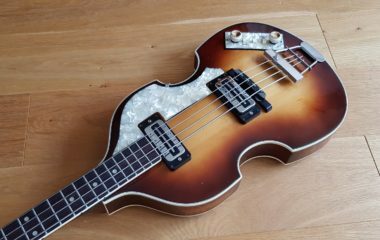 A quality Japanese made bass in high gloss Violin finish with a maple fretboard. These were popular instruments back in the day, and actually used by a few pro musicians. They do look a little dated now, but has a great vintage look. This example is in good condition, it has a few marks here and there, the worst being the buckle rash on the back. The two smaller knobs aren’t original but the hard to get Speed Dial ones are there and in good condition. 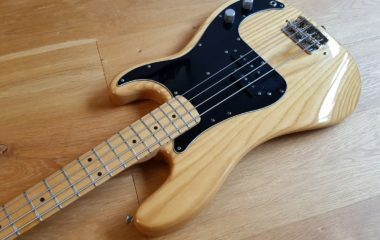 It’s and active bass, powered by a 9v battery and the electrics are all original and work as they should – actually very powerful. Definitely not a lightweight – comes in at 11.8lbs which was the fashion then….